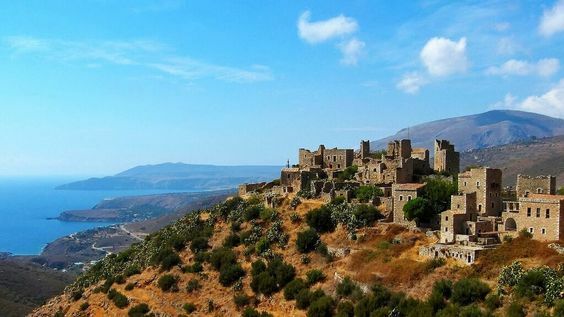 Lakonia is one of the most beautiful places in Greece. Monamvassia, Mani, Sparti, Gytheio, Mystras, Elafonissos, Gytheio, Diros Caves are all must a visit. A facinating landscape of unique beauty ideal for sightseein or a quiet and relaxing vacation. Byzantine and Frank forts fascinating Mystras, the Rock of Monemvasia, legendary Mani with its traditional stone castles, Diros caves and Sparti form a pole of attraction for visitors all year round. Mt. Taygetos ends at the cape of Tainaron, while the extension of Mt. Parnon stretches all the way down to Cape Kavos Maleas. Nearby is the quiet and sandy beach of Neapolis and further along Elafonissos Island, a hidden paradise of dunes and cedar trees. The history is indelibly inscribed on the monuments of different times. The tradition is constantly recycled in customs and practises and is vividly impressed in the architecture of buildings and villages. The natural beauty is manifest in the harmonious alternation of mountainous landscapes, fertile valleys, sun-drenched coasts. Peaceful and hospitable, with a gentle climate and pure air, Laconia offers the traveller all he/she might require for a pleasant holiday, but also for a sightseeing tour of inimitable riches and impressions. The Prefecture of Laconia lies in the southern part of the Peloponnese to the south of Arkadia and to the east of Messinia. It covers an area blessed by a generous nature with multi-faceted beauty. In the western part, north to south, rises stately Mt. Taigetos, with Profitis Ilias, the highest peak of the Peloponnese, at 2,407m In the eastern part Mt. Parnon is calmer and more approachable. Its highest peak, the Megali Tourla, is at 1,935m Between the two mountains flows the river Evrotas, which renders fertile the valfey of the historic city of Sparta and the plain of Elos (mentioned by Homer) before emptying after a course of 82km in the cove of the large Gulf of Lakonia, created by the famous peninsulas of Mani and Epidavros Umira. The peninsula of Mani is the western "leg" of Lakonia, the continuation of the Taigetos range. After a decline at the defile between Githion and Areopolis, we have the rocky outcrop of Lower Taigetos, rising to 1,218m and ending at Cape Tenaron. On the other, eastern "leg", Mt. Parnon turns to lower hilltops and a gentler climate in the peninsula of Epidavros Umira, up to its tip, sandy Elafonisos, and Cape Maleas. The Gulf of Laconia lies between the peninsulas, forming countless inlets, coves, harbours and beaches. Only its northern coast remains low, almost a straight line, due to the silt deposited by the Evrotas. Sparti, the capital, was for many centuries the leading city of the Lacaedemonians and one of the most important for the whole of Greece.